"It will be nice for me not to function as the rabbit this year, but to tuck in and enjoy the ride. I love to run fast. It would be icing on the cake to get the official American record on the course." - 2:04 marathoner* Ryan Hall talking in a teleconference where he explained his rationale for running the 2011 edition of the Bank of America Chicago Marathon - just 14 weeks before the 2011 US Olympic Trials - and talked about new race tactics he'll try out in Chicago. David Monti Takes A Look At Morgan Uceny's Rise To The Top Of The 1,500 Ranks The daughter of a brick-layer and bus driver knows a thing or two about hard work. She gives a lot of credit to her training partner Anna Pierce for her rise as well as her coach. Koreans Start 30 Day Countdown To World's The article claims that at the last world championship there were 8 billion tv viewers. We don't believe it. There are only 6.75 billion people on the earth. 132 Food Inspectors To Be On Hand in Daegu To Make Sure Food Isn't Tainted Apparently food poisoning is common in the summer in parts of Asia. Last week, a Chinese court sentence people for selling pork tainted with a poisonous chemical. Nickson Chepseba Looking To Prove The Team Selectors Wrong After Being Dropped From The Kenyan World Champs Squad Apparently Chepseba only learned he was replaced on the WC 1,500 team by Daniel Komen when he read the news in the media. Article also mentions Chepseba's unusual transition to the 1,500, as he was originally a volleyball player, then a 10k runner, and then moved down to the 15. Provisional Entry Lists For Stockholm DL The women's 5k will have a good match-up between OTC's Sally Kipyego, Vivian Cheruiyot, Shalane Flanagan, and Viola Kibiwot. In the men's 1,500, Silas Kiplagat, Asbel Kiprop and Nick Willis vs. US runners Russell Brown, Andrew Wheating, Lopez Lomong, Will Leer, Leo Manzano and David Torrence. The women's 800 has Caster Semenya, Morgan Uceny and Kenia Sinclair. 3k steeple: Paul Koech (guy Brimin Kipruto needs to thank for almost getting him the WR) headlines field that includes US's Dan Huling and Kyle Alcorn. *Carmelita Jeter Wants To Break Stadium Record At Stockholm The record is 10.90 set by Irina Privalova in 1994 and if she breaks it, she'll win a 1-carat diamond worth $10,000. UK's Olympic 400m Champ Christine Ohuruogu Was Originally The "Poster Girl" For The London Olympics She was replaced by heptathlete Jessica Ennis after she received a 1-year ban for missing three drug tests. 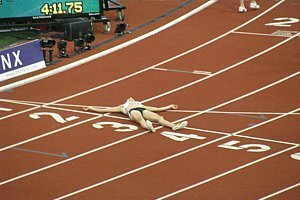 Today: BBC To Run Program About Top UK Olympic Moments That "Stopped The Nation"
Chris Solinsky Tweets About DNF & Admits He Should Have Finished Race "Tough Pill to swallow! Should gotten back on to at least get A standard 4 next year, but emotions (angry) took over. Back 2 Amy & training." Italian Dinner Parties & Natural Ice Baths Have Contribued To Nick Willis Getting In Medal Shape Willis trains, lives and races smarter than just about everyone. Nesta Carter Thought He Had Beaten Bolt "I thought I had him. But in the last 20m I messed up right there." 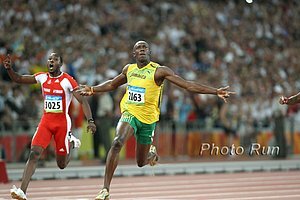 Prior To Monaco, Bolt Said He Wants Asafa's Start "If I could take one thing from any one athlete, it would be Asafa (Powell's) start. I would be unstoppable that day. If I could start as fast as Asafa can start, it's all over." After Getting Kicked In Calf In Paris On July 8th, Kenia Sinclair Resumed Training On July 21 Sinclair had been enjoying a great 2011, as she beat Morgan Uceny in NYC at 1,500 after rocking the SMR at Penn. Bernard Lagat Says He Has Mixed Emotions About His Monaco Race, Calls Mo Farah The Clear Favorite For Worlds And Even Compares Him To Kenenisa Bekele "All of us are going over there as the underdog ... I like being in the position where I can say, 'He's the guy and we're going to go after it.' For once, everyone won't be going in hunting Bernard Lagat." *Lagat Interview: Talks About Making Sure He Goes For His Drug Test Includes links to other interviews with Nick Symmonds, Morgan Uceny, Mo Farah and others. Good Interview With Nick Willis Post-Monaco 1,500 PR Talks about the "burden of his silver medal" and jokes about helping to break up the fist fight "to get on TV." 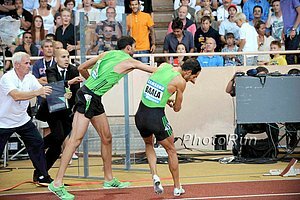 French 1,500m Runners Suspended Over Monaco Brawl And Also Lose Their Appearance Fees Could even endanger their chances of competing at the World Championships. *Some Better Quotes From The Fighting Frenchman Mekhissi-Benabbad: "I thought it was all a bit of a laugh, I approached him and he gave me a little headbutt, after which I responded. It's normal." Baala's comments were a bit angrier. Bolt Says He's Not Worried After Close Call To Nesta Carter In Monaco And maybe he doesn't need to be, as Carter didn't make the Jamaican team for Daegu. Just shows the depth of the Jamaican 100m team. 400m Winner Amantle Montsho Plays Down Her Status As WCs Favorite She's won 4 straight DL races, but she's right to still be worried as she only has the 2nd fastest time in the year and Allyson Felix still might do the 200/400 double. LRC DN Galan Preview: Merritt Returns, Asbel Kiprop & Silas Kiplagat Clash, And A Great Women's 800 And 5,000 Usain Bolt will race the clock in the 200, but the big story of the meet may be the return to action from his ExtenZe male-enhancement related drug ban for LaShawn Merritt. In the men's 1,500, Kenya's the world's best in Asbel Kiprop and Silas Kiplagat will duel in a race that contains a ton of Americans. 10 women who have run 1:58 this year will clash in the women's 800, including US champ Alysia Montano and Caster Semenya, as well as the women who was the top middle-distance runner on the year before getting injured - Kenia Sinclair. 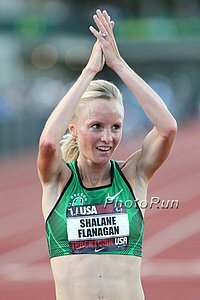 In the women's 5,000, 2011 Kenyan champ Sylvia Kibet will try to hand the best women's distance runner in the world in 2011, Vivian Cheruiyot, her first loss of the season on the track in a race that will feature another American record attempt by Shalane Flanagan. 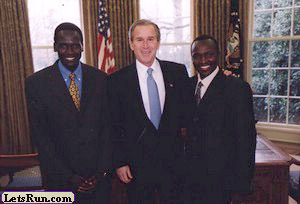 Plus Paul Kipsiele Koech and two Americans in the steeple. We break it all down for you - even the B heats that feature Nate Brannen, Molly Beckwith and Will Leer. Thursday Shot Put: On Comeback Trail From Feb. Surgery, Cantwell (21.70) Wins Shot Put In City Centre He'll try to defend his world title next month. Valerie Adams (20.57) won the women's. Athletics Kenya Now is Letting World Championship Team Members Race In Europe AK Head: “We have noticed that our athletes have become more professional in how they are competing and are using these races to maintain their form. This is very good for our country and that is why we allowed them to enter these events." 6 Events To Watch At This Weekend's UK Trials Mo Farah's 9th straight 5000 victor is a mere formality. Athletics Weekly Event By Event Preview of Women's Champs Hard to believe that no British women have A or B standard in 5,000 or 10,000. Thankfully, Worknesh Kidane, who in 2003 won World Cross gold, will race New Zealand’s Kim Smith and Japan’s Tomoka Inadomi in the 10,000. Athletics Weekly Event By Event Preview of Men's Champs Lots of foreign men will make the men's 10,000 more interesting. Top Two British LJers Chris Tomlinson and Greg Rutherford To Miss Trials With LJ They'll both go to world's unless two others get the A.
Russian Vera Sokolova's 20K Race Walking WR Ratified By The IAAF In related news, Guinness World Records ratifies records for largest tonsils removed and most nails filed in 8 hours. After Pulling Out Of Lucerne DL With Hand Injury Yelena Isinbayeva Says She Is Fine To Compete She will still compete in Stockholm this Friday. Article also mentions that Russia Athletics did not make her compete at their national championships to gain selection to WC team as most nations do. Finnish Savo Games: Colombia’s Catherine Ibarqueno's 14.59m TJ Highlights Meet Australia's Youcef Abdi won the steeple in 8:16.41. Russian Champs: Two Russians Led By Yekaterina Martynova Run 4:01 In 1,500 IAAF Martynova's 4:01.68 was nearly a 3-second PR. Two men ran 3:36 in the 1,500. *Day 3 Russian Champs Recap World record holder and 2008 Olympic steeple champion Gulnara Galkina-Samitova, who is on the way back after maternity leave, was 4th in 9:32.07. *Athletics Weekly Of Entire Russian Champs Drug chat Anastasiya Kapachinskaya ran 49.35. 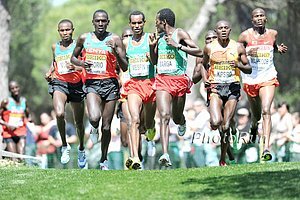 World Military Games: Recap - Kenyans Excel A couple of real Kenyan studs showed up, including Mark Kiptoo, who was 4th at the Kenyan trials in the 5,000, and Lausanne 5k winner Vincent Chepkok. They both ran 13:06. Barcelona: IAAF Recap: Spain's Kevin López Wins 800 In 1:44.49 As US's Tyler Mulder Gets 3rd In 1:44.83 Stuff many people missed in the results included Zerseney Tadese's 5+ second win in the 5000 in 12:59 as well as Leo Manzano 1:45.52, Lopez Lomong 3:33.59, Russell Brown 3:36.34, and Adrian Blincoe with A standard of 13:18.27. Yesterday, we mentioned Ben Bruce 8:19 Steeple, AJ Acosta 3:38 1,500m B Win, Ohuruogo 51.49, Hannah England 4:01 1,500, Geena Gall 2:01. Day 2 Recap Parker Stinson got gold in the 10,000. Science Of Sport Guys Get NYTimes Column: "A Doping-Free Tour de France?" Performances have apparently returned to pre-EPO and pre-1989 levels.